photo courtesy Glenn Miller, Oregon Dept. of Ag. 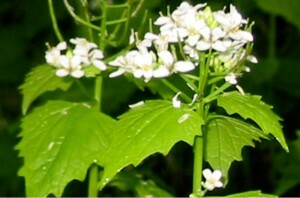 Garlic mustard is a biennial herb that ranges from 12 to 48 inches in height as an adult. Leaves and stems emit the distinctive odor of onion or garlic when crushed. First year plants are a rosette of 3 or 4 kidney-shaped, scallop edged leaves. Second-year plants generally produce one or two flowering stems with numerous white flowers that have four separate petals forming a cross. The plant produces black, oblong seeds in 1 to 2 ½ inch slender pods called siliques that radiate from the stem just below the flowers. Its slender taproot is “s”-shaped at the top. During the rosette stage, garlic mustard resembles Viola ssp., and several plants in the Saxifrage family, including Tellima grandiflora (fringecup) and Tolmiea menziesii (piggy-back plant). A distinguishing characteristic of the saxifrage are the presence of long hair, particularly on the leaf stems – which mature garlic mustard does not have. Garlic mustard can be found throughout the year, but it is most easily recognizable in the spring when second year plants are in bloom. Look in the partial or filtered light of forest understory or edges. It is also found in shaded roadsides, urban areas, riparian areas, along hiking trails, and on agricultural lands. Only pull if there is a small population and you are absolutely certain of its identification. Bag and remove pulled plants, as seed ripening continues even after plants are pulled.